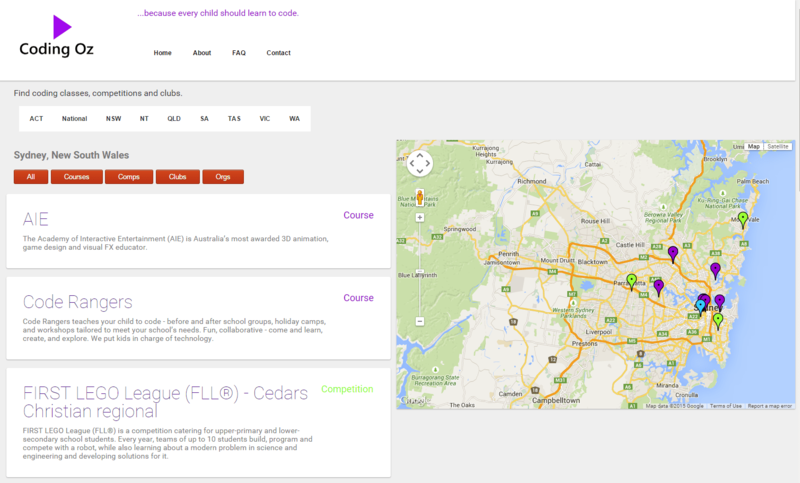 Coding Oz is a shiny, new one-stop resource to find coding classes, clubs and competitions around Australia. While there are a lot of global resources for kids wanting to get involved in coding, there aren’t so many local ones in Australia, and finding those that do exist can be an issue. Local resources are important for learning face-to-face, for fitting in with the Australian school curriculum, and for spelling ‘colour’ properly. Coding Oz is a simple search facility that gives access to local coding resources – there’s no more to it than that. There’s no advertising, no editorialising (descriptions come from the linked organisation’s own site), and no fuss. It’s determined aim is to keep things as simple as possible while still being useful. Organisations that want to list just need to contact Coding Oz. Disclosure: there is a significant staffing overlap between Coding Oz and Geek in Sydney so this article cannot claim any degree of objectivity – and that’s why the only adjectives here are ‘shiny’ and ‘new’. ← Is Bill Shorten’s coding in schools speech more than a thought bubble? What a fabulous idea Evan!